Welsh skeleton athlete Laura Deas says she is having to deal with increased pressure with Olympic champion Lizzy Yarnold on a sabbatical. Yarnold, the 2014 Olympic champion, will miss the 2015-16 World Cup season as part of a 12-month break from skeleton. 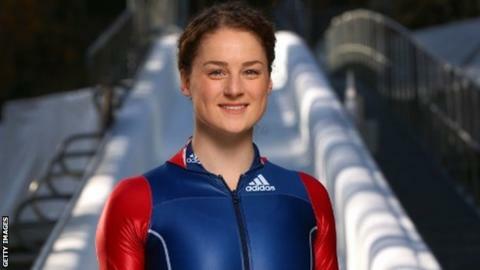 Deas, 27 will start the season, which begins on 28 November, as British number one in Yarnold's absence. "There is an expectation that there wasn't before," Deas said. Yarnold has won Olympic, World, European and overall World Cup golds in the last two years but insists she is not quitting and will return rejuvenated. During the 2014-15 World Cup series, Wrexham-born Deas won silver in Calgary and bronze in St Moritz and finished fifth overall. Deas has prepared for the new season in Canada and says she is in "good shape" ahead of the first series event in Altenberg, Germany. "It definitely feels different this year because everybody's a bit more clued up as to who I am," Deas told BBC Radio Wales. "There are definitely people out there with a lot more experience than me so I don't feel like one of the most experienced ones yet but I'm getting there. "The focus we're looking towards is the World Championships in February and I'm feeling positive I can deliver at the moment."